Export as excel is one of the most wanted feature in an enterprise application. 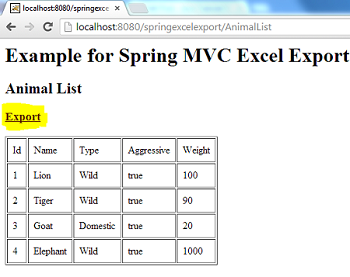 In this tutorial let us learn about export as excel feature using Spring MVC framework. If you are a beginner, go through the Spring MVC tutorial before taking this. We will be using Spring 3 annotation based approach for the web application. If you have learned Spring MVC, there is not much to discuss, in this excel export tutorial. All you have to know is, Spring provides a class AbstractExcelView which is a view in the MVC. We need to extend this class and write our custom classes. Then configure our custom class as the view in the MVC. Extend AbstractExcelView and write a custom excel view. There is a method buildExcelDocument in this class, which we should override to build the excel. Configure the new custom class, which we have created as the view in the Spring MVC. We should imagine this new java class file as a replacement for the JSP which we generally will have in the view. Do not call the service layer or DAO directly from the view class. Similarly, it should not contain the business logic of the application. Call to service/business should happen from the controller and the model should be built. Only the model should be sent to the view. This view class, should just construct the excel header, rows and formatting. Maven is used to manage the dependencies. If you do not have Maven, it is better to download and setup Maven. This is the important class in the excel export tutorial. This serves as the View in Spring MVC by extending the Spring’s AbstractExcelView class. Just added couple of methods from the previous MVC hello world tutorial. Access DAO via service layer for data. Comments on "Excel Export in Spring MVC"
Thanks Joe , due to your articles only I am in touch with Java. How to change this file name to export.xls? Thank you so much. Its really very helpful to me. How to group and subtotal in excel sheet using POI? create view bean and then return new ModelAndView(“beanId” , “model” , output) from your controller . I have a question,how can I change the file name in every request? What if the service class is an interface ? How to get the values from DB through it ? Comments are closed for "Excel Export in Spring MVC".